Sea-view balcony, parquet, air conditioning, SAT-TV LCD and free SKY channels, rediffusion, mini-bar, safe, direct-dial telephone, hair-dryer and en suite facilities with shower. Are the latest rooms totally re-decorated. Among other things a particular care of the bathroom comfort and details has been made. Renewed Room with balcony facing the sea is equipped with sea-view balcony, parquet, air conditioning, SAT-TV LCD and free SKY channels, rediffusion, mini-bar, safe, direct-dial telephone, hair-dryer and en suite facilities with shower.The balcony is facing the sea with a wonderful view. 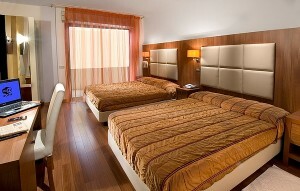 The Superior Room is located on the top floor on the hotel. 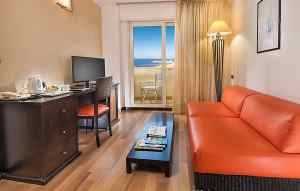 It is equipped with all comforts and sea side balcony and whirpool bathtube or large rainshower and sky decoder with 32” Tv and english broadcasting channels. Two balconies composed of 2 connecting rooms and a bathroom with whirpool bathtube. Tv in each room, one with personal sky decoder and the other one with Sky channels tuned. This room can comfortably fit 3-5 people. Is equipped with a double sea front balcony and two windows sea front. 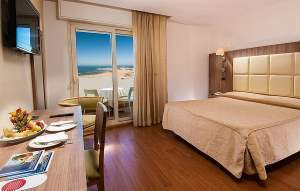 Is located on the hotel top floor with sea front balcony. The sitting room is separated from the large bedroom by a connecting door. It is equipped with whirpool bath, two lcd screen tv, sky satellite receiver. Breakfast is served in the room at any time and it is included. * Rates are per person per day in Double Room. for 4th or 5th extra bed reductions are calculated according to the age. Single Room: € 13,00 per day.